I was a participant at Kevin Rudd's 2020 summit. But I was not part of any stream that produced a nation changing outcome. After the summit, I was asked to chair the National Human Rights Consultation which investigated one of the big ideas from the summit — a national Human Rights Act. But the changes which followed were much more modest than that. 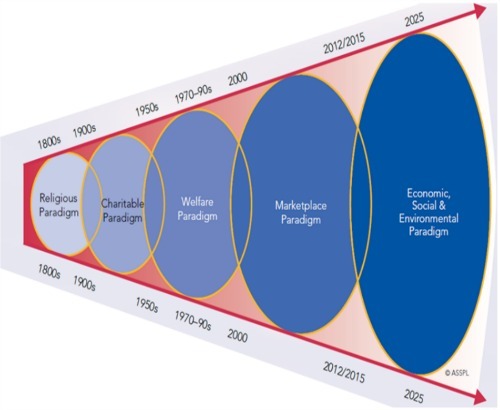 So I pay tribute to Bruce Bonyhady and John Della Bosca who took forward one of the few 2020 Summit ideas which was really big, really new, likely to make a huge difference in the lives of Australians, and now given a chance of actual realisation. I commend them and politicians like Bill Shorten and Jenny Macklin for seeing through a commitment to replacing a disability system based on welfare with one based on insurance, investment and individualised funding. I also commend those like Mitch Fifield in the Coalition who have worked to ensure a bipartisan approach to this issue even during the dreadful days of the last toxic Parliament. On 16 May 2013, Fifield told the Senate: 'The Coalition has supported the establishment of the NDIS every step of the way. We want it to be a success.' It is heartening that the Abbott government has maintained this commitment. If it succeeds, the NDIS will provide comprehensive insurance (an individualised support package) for 460,000 of the 4 million Australians suffering some form of disability. Bruce Bonyhady has long claimed that the political appeal of an NDIS lies in the fact that any of us or any member of our family could in the future be in need of future assistance from such a scheme. As he says, 'The NDIS is for all Australians because none of us know when we may acquire a disability ourselves, or have a family member with disability.' This is the first real challenge in times of political change and in times of financial constraint. The average punter who knows little about these issues wonders how the scheme can be marketed as being for all Australians while at the same time providing direct benefits and coverage only to 12 per cent of those suffering disability. Australians will maintain faith in the NDIS only if they are convinced that the other 88 per cent are not being left behind, and if they are assured that the cut-offs for eligibility are coherent, comprehensible, fair and transparent. The market for disability services will need to be underpinned with a strong and robust internal risk management framework. There will be an increasing number of for-profit operators in the sector. Hopefully the not-for-profit operators will make the necessary adaptations competing in the market and providing the ethos for the market to deliver services in a dignified, fair and transparent manner. In seeking the views of the Australian public during the National Human Rights Consultation in 2009, we made use of new technologies, conducted community consultations and received tens of thousands of submissions. I ran a Facebook page. We hosted a blog and commissioned academics on opposite sides of the argument to steer the blog debate. We held three days of hearings which were broadcast on the new Australian Public Affairs Channel. During the course of our consultation, various groups ran campaigns for and against a Human Rights Act in the wake of Australia's ongoing exceptionalism, Australia being the only remaining country in the British common law tradition without some form of Human Rights Act. Groups like GetUp! and Amnesty International ran strong campaigns in favour of a Human Rights Act, accounting for 25,000 of the 35,000 submissions we received. My committee did not see itself as having the competence or authority to distinguish campaign generated submissions from other submissions. We simply decided to publish the figures and let people make their own assessments. At community roundtables, participants were asked what prompted them to attend. Some civic-minded individuals simply wanted the opportunity to attend a genuine exercise in participative democracy; they wanted information just as much as they wanted to share their views. Many participants were people with grievances about government service delivery or particular government policies. Some had suffered at the hands of a government department or at least knew someone who had been adversely affected — a homeless person, an aged relative in care, a close family member with mental illness, or a neighbour with disabilities. Others were responding to invitations to involve themselves in campaigns that had been instigated when the Consultation was launched. Against the backdrop of these campaigns, the Committee heard from many people who claimed no legal or political expertise in relation to the desirability or otherwise of any particular law; they simply wanted to know that Australia would continue to play its role as a valued contributor to the international community while pragmatically dealing with problems at home. Having ratified these seven important human rights treaties, Australia has voluntarily undertaken to protect and promote the rights listed in them. This was a tension for us in answering the first question. Many roundtable participants and submission makers spoke from their own experience, highlighting those rights most under threat for them or for those in their circle. Others provided us with a more theoretical approach, arguing that all Australia's international human rights obligations should be complied with. True to what we heard from the grassroots, we singled out three key economic and social rights for immediate enhanced attention by the Australian Human Rights Commission — the rights to health, education, and housing. We thought that government departments should be attentive to the progressive realization of these rights, within the constraints of what is economically deliverable. However, in light of advice received from the Solicitor-General, we did not think the courts could have a role to play in the progressive realization of these rights. We recommended that the federal government operate on the assumption that, unless it has entered a formal reservation in relation to a particular right, any right listed in the seven international human rights treaties should be protected and promoted. There is enormous diversity in the community when it comes to understanding of rights protection. 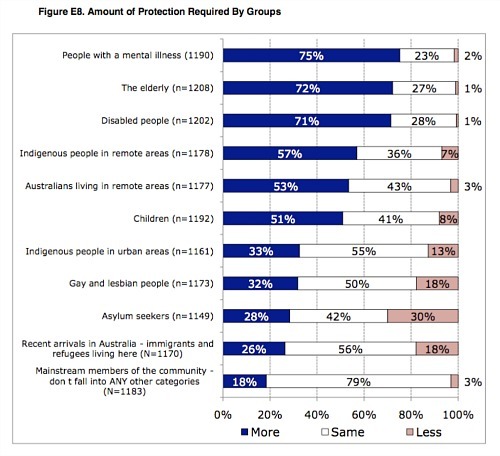 Though two thirds of those who participated in the random survey thought human rights were adequately protected in Australia, over 70 per cent identified three groups in the community whose rights were in need of greater protection. The majority of those surveyed also saw a need for better protection of the human rights of those living in remote rural areas. The near division of the survey groups when it comes to the treatment of asylum seekers highlights why this issue recurs at Australian elections. When he was Archbishop of Canterbury, Rowan Williams gave an insightful address at the London School of Economics pointing out that rights and utility are the two concepts that resonate most readily in the public square today. But we need concepts to set limits on rights when they interfere with the common good or the public interest, or dare I say it, public morality — the concepts used by the UN when first formulating and limiting human rights 66 years ago. These concepts are no longer in vogue, at least under these titles. We also need concepts to set limits on utility when it interferes with the dignity of the most vulnerable and the liberty of the most despised in our community. Addressing the UN General Assembly to mark the anniversary of the UN Declaration of Human Rights (UNDHR), Pope Benedict XVI said, 'This document was the outcome of a convergence of different religious and cultural traditions, all of them motivated by the common desire to place the human person at the heart of institutions, laws and the workings of society, and to consider the human person essential for the world of culture, religion and science...(T)he universality, indivisibility and interdependence of human rights all serve as guarantees safeguarding human dignity.' It would be a serious mistake to view the UNDHR stipulation and limitation of rights as a western Judaeo-Christian construct. Mary Ann Glendon's A World Made New traces the remarkable contribution to that document by Eleanor Roosevelt and an international bevy of diplomats and academics whose backgrounds give the lie to the claim that any listing of human rights is a Western culturally biased catalogue of capitalist political aspirations. The Frenchman Rene Cassin, the Chilean Hernan Santa Cruz, the Christian Lebanese Adam Malik and the Chinese Confucian Peng-chun Chang were great contributors to this truly international undertaking. They consulted religious and philosophical greats such as Teilhard de Chardin and Mahatma Gandhi. Even Aldous Huxley made a contribution. It was the Jesuit palaeontologist Teilhard who counselled that the drafters should focus on 'man in society' rather than man as an individual. The drafters knew that any catalogue of rights would need to include words of limitation. The Canadian John Humphrey who was the Director of the UN secretariat servicing the drafting committee prepared a first draft of 48 articles. The Australian member of the drafting committee Colonel Hodgson wanted to know the draft's underlying philosophy. Humphrey refused to answer, replying 'that the draft was not based on any particular philosophy; it included rights recognised by various national constitutions and also a number of suggestions that had been made for an international bill of rights'. In his memoirs, Humphrey recounts: 'I wasn't going to tell him that insofar as it reflected the views of its author — who had in any event to remain anonymous — the draft attempted to combine humanitarian liberalism with social democracy.' It is fascinating to track the different ways in which the committee dealt with the delimitation of rights. Humphrey proposed that an individual's rights be limited 'by the rights of others and by the just requirements of the State and of the United Nations'. It may be in this grey area between rights and utility that social inclusion has work to do — work that was previously distributed amongst concepts such as human dignity, the common good, the public interest and public morality. Individuals and community groups living under law in the State are entitled equally to connect with their local community, to deal with crises in religiously and culturally appropriate ways, and to have their voices heard. In the legal academy there continues to be a great evangelical fervour for bills of rights. This fervour manifests itself in florid espousals of the virtues of weak statutory bills of rights together with the assurance that one need not be afraid because such bills do not really change anything. Those of us with a pragmatic, evidentiary approach to the question are well positioned given that two of Australia's nine jurisdictions (Victoria and the ACT) have enacted such bills of rights with the double assurance that nothing has really changed and that things can now only get better. It will be interesting to hear an assessment of the socially inclusionary benefits of a bill of rights which provides lawyers and judges with greater access to the realm of policy and service delivery. Article 4 of the Convention on the Rights of Persons with Disabilities provides: 'With regard to economic, social and cultural rights, each State Party undertakes to take measures to the maximum of its available resources and, where needed, within the framework of international cooperation, with a view to achieving progressively the full realization of these rights, without prejudice to those obligations contained in the present Convention that are immediately applicable according to international law.' So we must always have an eye to what resources are available when discussing the rights to housing, health, education, and employment. We need to concede that these rights, unlike civil and political rights, are susceptible to progressive realization in the polity. The market of the NDIS will ensure the protection and progressive realization of the human rights of persons with disabilities and their carers if and only if there is a safety net for those exploited by incompetent providers and for those who make ill-informed decisions for their long term care. We need to ensure that the reach of the NDIS extends to the poor, less educated, less connected person living in remote Australia as well as to the middle class, educated, well connected city dweller. We need to ensure that the person with disabilities who falls just on the 'wrong' side of the line for coverage understands why she does not qualify and how she will be adequately cared for. We need to educate the public and bring them with us explaining how differential treatment for 12 per cent of those with disabilities works not only to enhance their choices and human rights but also contributes to the common good and the protection of human rights of those falling outside the scheme's immediate application. A market of choice for some can contribute to the enjoyment of human rights by all, but that will be a regulated market with a robust safety net. The implementation of the NDIS will bring change. And those people with disabilities who are most vulnerable are those without family members to advocate for them and those with mental health issues whose family members have been alienated by the illness. Of course, these are the people who need the most protection. It's interesting in Figure 1. 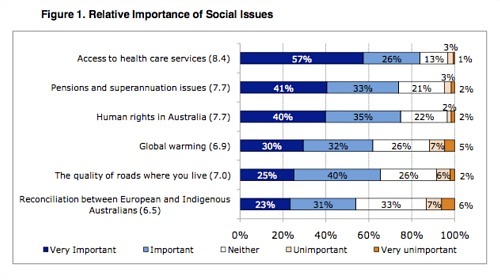 Relative Importance of Social Issues that "the quality of roads where you live" was deemed more important than "Reconciliation between European and Indigenous Australians". The car rules, OK. The common good: fixing pot holes in the roads.